There are so many different types of e cigarette available these days that it can be a little overwhelming if you’re just starting out! We’ve compiled a list of the different e cigarettes available with information on how they work and the pros of each device to help you find out more. You can then read our guide to choosing a vape kit to help you on your way to buying your first e cigarette. Cigalikes are, as the name suggests, the most similar to a traditional tobacco cigarette in that they are a similar size and shape and are built to closely replicate tobacco smoking. Therefore, people often find these are ideal when first starting out with e-cigs as they can seamlessly switch between them and real cigarettes. The sensation you get from them is the inhalation of vapour which also provides a ‘throat hit’ similar to that which you would experience with tobacco smoke, but without all the harmful chemicals. You do not need to press a button and simply inhale to activate the vapour. Cig-a-likes most commonly consist of a rechargeable battery and replaceable ‘refills’, ‘cartridges’ or ‘cartomisers’. The batteries are small and usually last a few hours for heavy users or a couple of days if only used very occasionally. The end of the battery lights up as you inhale to show that it is charged and working, and also to further replicate a real cigarette. The battery light will usually flash and then go out to indicate that it needs charging. How Do Cigalike E Cigs Work? When you inhale, a sensor triggers the heating chamber (known as the atomiser) to heat a small amount of liquid from the cartridge. This turns it into vapour which is drawn into your mouth through the central hole in the cartridge. The combination of a larger e-cig battery and a higher concentration of e-liquid means this type of vape kit usually creates more vapour than the cigalike style. You can refill the tank with any e-liquid of your choice with lots of flavours and nicotine strengths available. These are usually a progressive device for people who have started on cig-a-likes but would like to try something different. This device consists of a larger, longer battery that is usually more powerful than those of a cig-a-like. They also feature a refillable tank which screws onto the end of the battery and has a mouthpiece on the other end. These tanks usually contain a replaceable ‘coil pack’ which contains the wicking material and coil that heats up and atomizes the e liquid. How Do Classic Vape Kits Work? Usually, classic vape kits work slightly differently to the cig-alike in that you press a small button on the side whilst inhaling, to activate the production of vapour. With these kits, you can usually lock the battery to prevent it from being turned on whilst in your pocket, for example. This is usually achieved by pressing the button 3 or 5 times in quick succession. The tank contains the atomizer and a coil and can be refilled with any e liquid with a 50% of above PG ratio. As above, these kits tend to come with a tank that uses a replaceable coil. It’s difficult to define how long a coil will last as this can depend on the brand, frequency of use and type of e liquid used. You’ll know when to replace it though as you’ll notice a deterioration in the flavour of your vape. New coils must always be primed before use (guide to priming a coil). Pod mods tend to fall somewhere between a cigalike and a vape kit. They come in a variety of shapes and sizes but are often a flat pen shape, fairly small and designed to fit neatly in the hand. They’re very easy to use and are popular both amongst beginners and more advanced vapers. Pod kits usually consist of a rechargeable battery and a replaceable ‘pod’. The pod contains the coil pack and liquid tank, and can either be bought pre-filled with liquid or are refillable. Some kits have a cap over the pod to act as the mouthpiece and others incorporate the mouthpiece into the pod. Once a pod is empty (in the case of pre-filled pod kits) or the coil has burnt out, the pod is discarded and replaced with a new one. How Do Pod Mods Work? Pod mods work in exactly the same way as other vape kits and are usually activated automatically when you inhale, similar to the cigalike. Sub ohm vape kits, similarly to classic kits, consist of a refillable tank and either a built in or removable battery, sometimes even multiple batteries. The battery is usually encased in a pen or box shaped casing. These kits tend to have more powerful batteries and use lower resistance coils than a classic vape. This combination heats the e-liquid in the tank at a faster rate and creates bigger clouds of vapour. The thicker clouds created with these kits tend to be more suited to more experienced vapers but you can pick up some great entry-level sub ohm kits. Some kits are very easy to use with just a single button to activate, however there is a huge range of devices available. Some of these devices are highly customisable, allowing you to use different tanks and adjust the wattage and/or voltage output. With so many customizations, mod kits all tend to be constructed slightly differently. However, almost all of them consist of the usual battery and tank. Some kits use removable batteries (such as the SMOK Priv V8), some have integrated tanks and there are many different shapes & sizes available. The square shaped kits tend to be referred to as ‘box mods’ but you can also purchase pen style sub ohm kits. How Do Sub Ohm Kits Work? These devices work in much the same way as regular vape pens in that the battery heats the coil which atomizes the vapour. The difference is in the resistance within the coil. You can find out more about sub ohm vaping here. 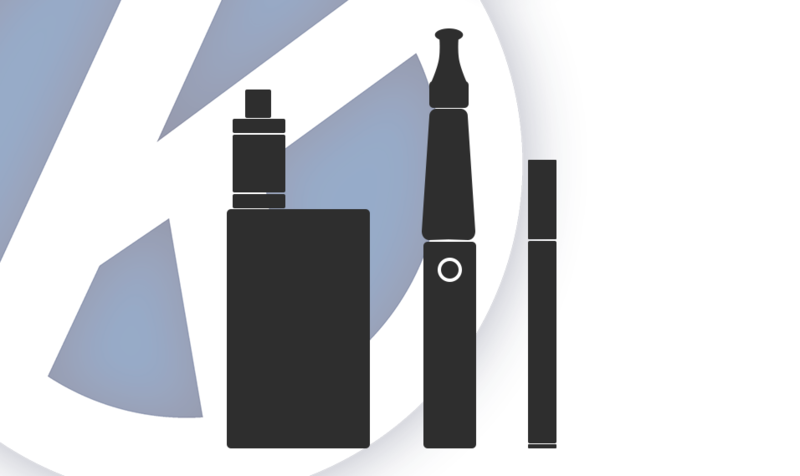 We hope our guide to the different types of e cigarette has given you a bit more insight into the vaping products available. Don’t forget to check out our guide to choosing a vape kit. If you have any other questions, head to our information hub or contact us and we’ll be happy to help. « Are E Cigarettes Safe?